The Cariboo Gold Quartz Mines (CGQ) and Island Mountain Mines were the first two hard rock (lode) mines operating in Wells. Both mines had ore bearing quartz veins containing gold and both had veins that ran almost side by side along each other. However, Cariboo Gold Quartz's veins were larger both in length and width; and as a result, it's production rate was over twice the that of Island Mountain Mines. The average gold content of the veins were about the same in both mine areas, but the Cariboo Gold Quartz Mine held more gold than the Island Mountain Mine. 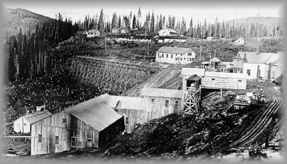 Cariboo Gold Quartz Mine consisted of 15 mineral claims amounting to over 750 acres, extending over a distance of a mile along the rich mineral belt which fed the placers of the Barkerville area. The company originated in late 1926 with Fred Wells as one of the directors. The Rainbow Group consisted of 3 claims owned by Al W. Sanders that were located on Cow Mountain at 4650 feet elevation, west of Lowhee Creek. Al, an old Cariboo prospector and friend of Fred Wells, formed the Sanders Group and the claims were owned and controlled by the Cariboo Gold Quartz Mining Company when Fred Wells purchased them from him. Fred himself drove the first adit into Cow Mountain in 1927 for further exploration of the Sanders vein. 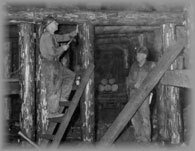 The Cariboo Gold Quartz Mine began successful production January 10, 1933; the first gold brick produced from this mine was in April, 1933, shipped out of the Cariboo by Fred. The first "brick" actually consisted of two bricks which together weighed 1410.62 troy ounces. and totalled in value $22,116.7719. Over the next seven years, $1,679,968.00 was returned to the shareholders of this mining company. However, problems began when profits slowed and shareholders and reporters criticized the management of the Cariboo Gold Quartz Company. This led to investigations into mining operations there. After a favourable report by engineer J. Norman Wynne, R. R. Rose, general manager of Cariboo Gold Quartz, was appointed managing director.